Location: Haverhill, Massachusetts • Date: 6/16/11 • Standard Print (w & h): Image: 49.1" x 32.0"
This image of two fast food restaurants is composed of 13 individual shots taken at 200mm. I was walking toward downtown Haverhill when I saw these two store fronts joined at the hip. 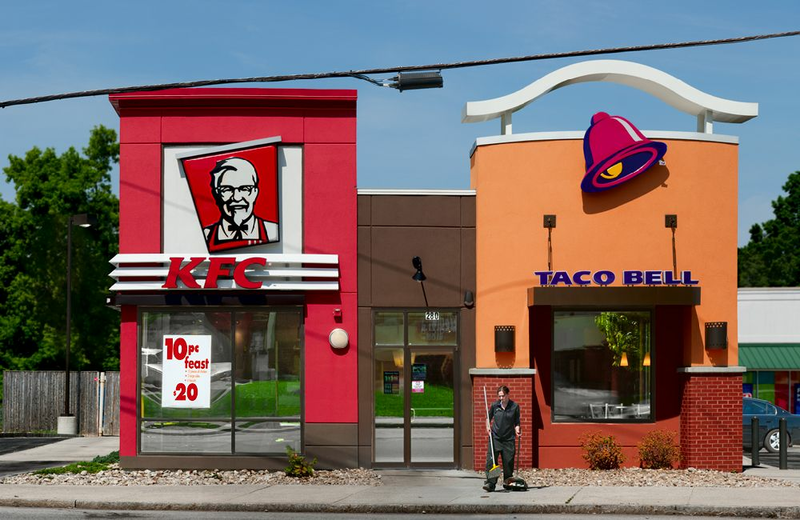 I first noticed the "10 pc Feast" sign, and then the electrical cable junction between the two facades. As I thought about the feast and the cable, an employee walked out the door to clean the sidewalk and parking lot. Shortly after appearing, she paused to light a cigarette.